As usual I arrived at this recipe in a rather convoluted way. 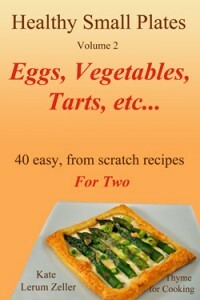 I had seen a Moroccan pie on one of the cooking shows that looked fantastic, easy and it used phyllo. Admittedly, I pay less than a dollar for a package of 12 sheets of phyllo but I still hate to waste any of it. And 12 sheets is a lot of phyllo. Then I saw a quiche on Pinterest that had sausage and spinach and feta in it. I liked that…. But I didn’t have any spinach or feta. I had Brussels sprouts and goat cheese. And we all know I don’t make pastry crusts. 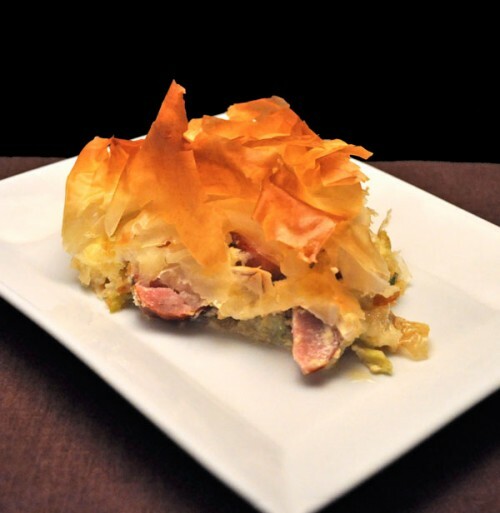 Thus a Phyllo Pie is born…..
Use as many Brussels sprouts as needed to cover the bottom in a single layer. Heat 2 tsp oil in a large skillet over medium heat. Add onion, Brussels sprouts and sauté 10 minutes, until the sprouts are barely tender. Add herbs, paprika and remove from heat. Lightly oil a 9″ (22 cm) pie or quiche plate. Place in quiche plate and, using the side of your hand, shape it to fit the inside, leaving the edges hang over the side. Repeat with remaining 5 sheets of phyllo, placing each one at a ‘1/6 turn’ of the quiche plate. Spread Brussels sprouts and onions on the crust. Layer the sausage slices on the sprouts and the goat cheese on the sausage. 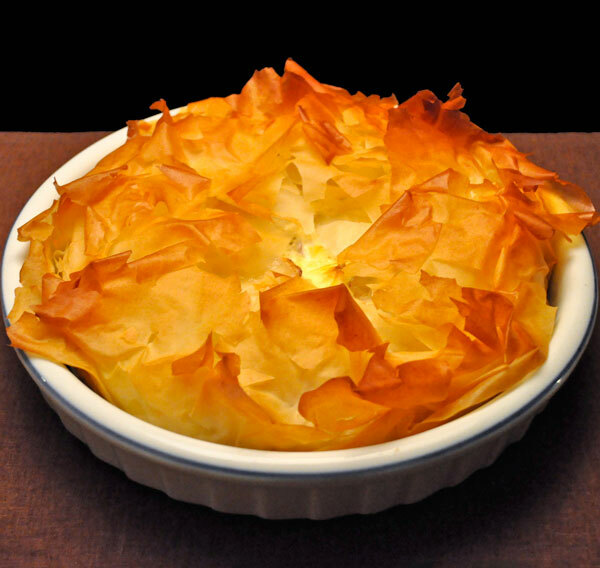 Loosely fold the edges of the phyllo over the top. Mine did not cover to the center. Bake, 400F (200C) for 35 – 40 minutes, or until top is set. Remove and let stand 5 minutes before serving. Note: It’s easier to handle if you put the pie on a baking sheet before filling. Phyllo dough and puff pastry are more things that are different here. I think that in the US both of those are found in the freezer section at the supermarket. How inconvenient….. I’d never remember to thaw it. Here there is a rather large display of various types of dough in the dairy section. I can get phyllo, (of course), 2 different types of puff pastry, 2 different types of traditional, shortcrust or pie crust pastry (one for sweet, one for savory) pizza crusts and a mix for chocolate lava cakes. It’s a large section, and it’s obvious that the French use these pre-made crusts and doughs regularly. But they don’t use boxed or packaged food. Yes, you can find a tin of cassoulet…. And I saw Ramen Noodles once in the International Foods section, but that’s about it.There are no long aisles of Hamburger Helper and boxed Macaroni and Cheese and it’s been so long that I can’t even think of other examples. In the US all the doors open outward. I will let you use your imagination as to how many doors I have banged into or tried to open the wrong way. One would think I would learn. I just did it again yesterday. Correction: I am not referring to doors in houses but the big glass doors in stores and malls and public buildings. In US houses outer doors open out and inner doors open in; public doors open out. We don’t have screen doors in houses here and our doors open inward. Do you know why the doors open out in North America? It is incase of an explosion all the door will be blown out and if you are still alive you can get out the door!! Hmmmm, I look at all my doors, and they all open inward. And I think back to all my previous houses and THEY all opened inward. HUH? Hmmm, my entrance/egress doors open out. My half bath door opens out. The door from my upstairs bonus room/soon to be master bedroom opens out…and I live in Michigan. I don’t think I’ve ever seen a front door that opens out here. Not the big door. A storm door, yes, but not the solid front door. This recipe looks wonderful! I love brussels sprouts. Evelyn, I thought it was in case of riots so the people running towards the door could just push and leave, rather than have to back up into the crowd to pull it open…. Same thing, really.